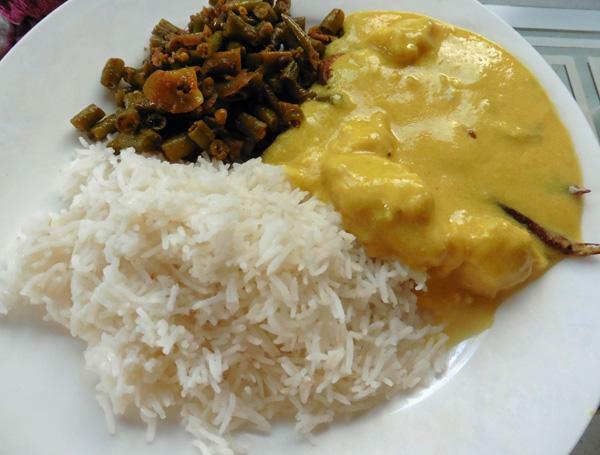 You can add vegetables to the kadhi sauce while it is cooking. Specially nice are chopped spinach (palk) or fenugreek (methi) leaves. 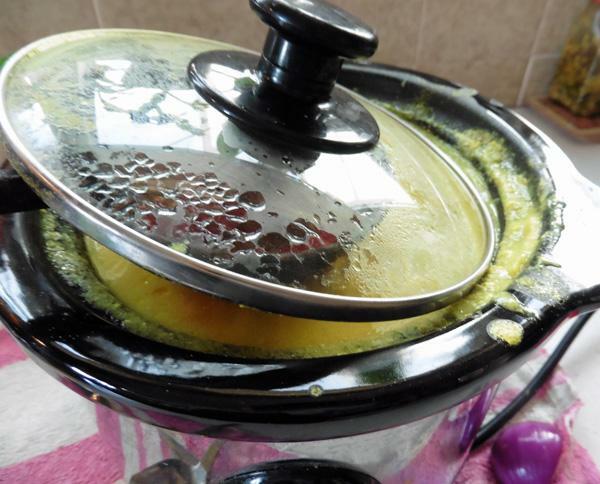 Experiment with diced potatoes, carrots or any other vegetable of choice. 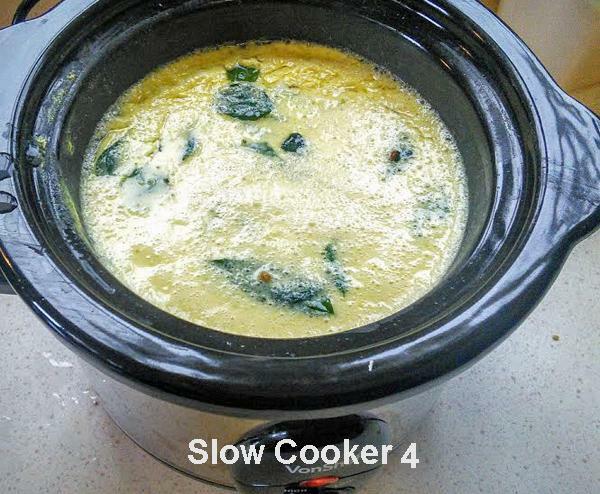 If you have a slow-cooker, make it in that. Slow cooked Kadhi is the best. Also see Microwave Pakore in Notes. Place yogurt and sifted besan in a bowl, along with salt, chilli, turmeric and water. Beat together to make a smooth, thin batter. 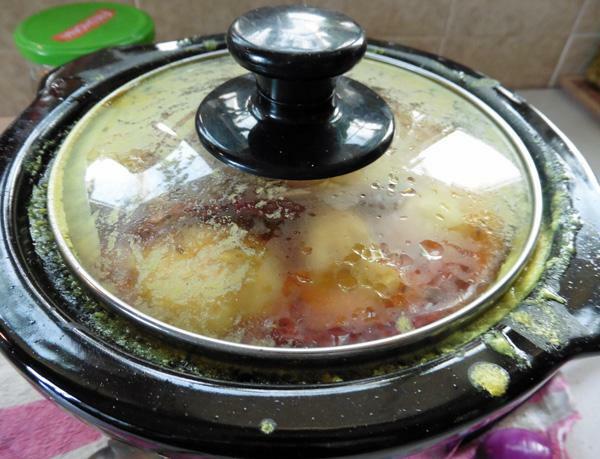 Transfer to a slow cooker and switch on ‘high’. 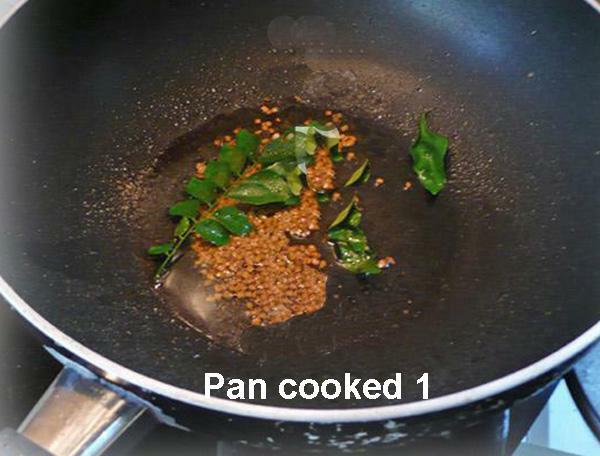 Heat oil in a ladle, add fenugreek seeds, asafoetida powder and curry leaves. 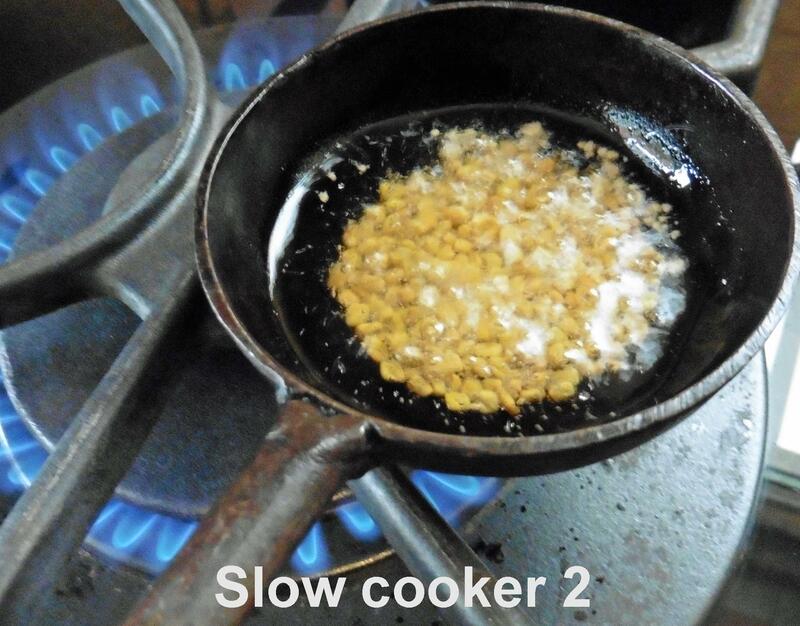 As soon as fenugreek seeds begin to turn brown (do not let the seeds turn dark brown or black, they turn bitter), pour over the yoghurt-besan mix in the slow-cooker, closing the lid for flavours to infuse. 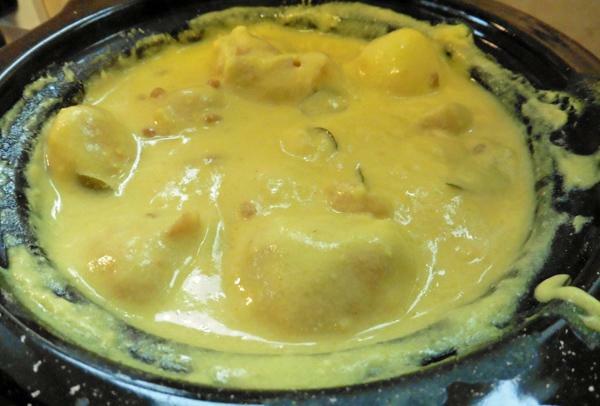 Let the kadhi cook for a few hours until it is custard like consistency. Add pakoras, turn the cooker down to slow to keep it warm. Place yogurt and sifted besan in a bowl, along with salt, chilli, turmeric and water. Beat together to make a smooth, thin batter. 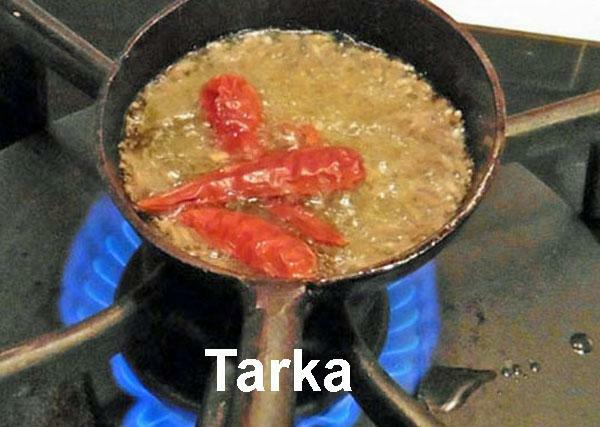 Heat oil in a wok/karahi or a pan. Add fenugreek seeds and asafoetida powder. 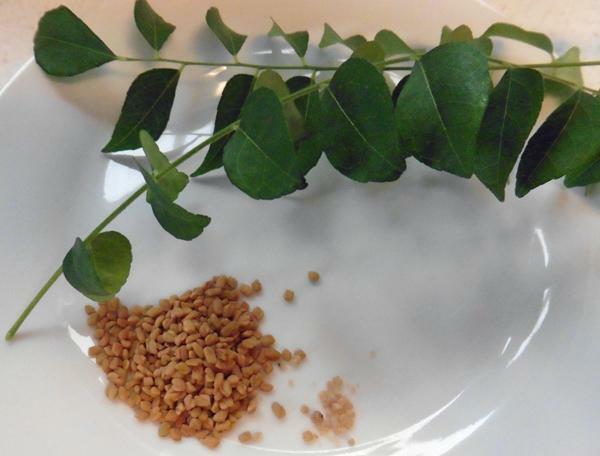 As soon as the seeds begin to turn brown, add the curry leaves. Stir for 5 seconds and add yoghurt-besan mix. Do not let the seeds turn dark brown or black. They turn bitter. Bring to boil, stirring frequently, until it stops bubbling boil over. Turn heat down to low-medium. Let it simmer gently, until the sauce reaches a custard like consistency, stirring from time to. Placing a heavy ladle in the pan also helps to stop it from boiling over during simmering. Do not leave it and go away, or you may return to find your cooker covered in boiled over kadhi! 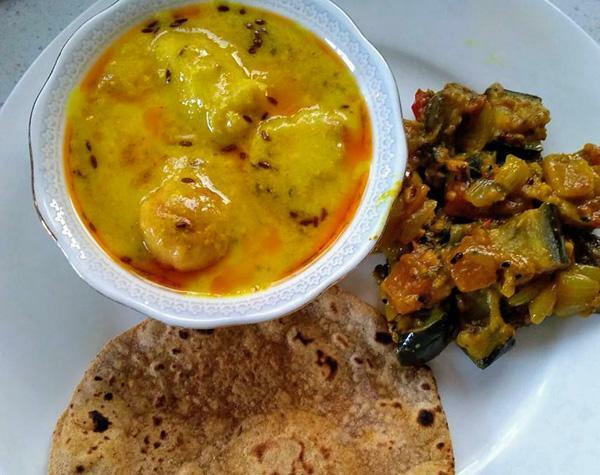 Allow kadhi to cook on low heat for at least 1/2 hour. My aunt, who lived in a village in India, cooked hers on hot ashes from the charcoal fire, for hours and hers was always delicious! 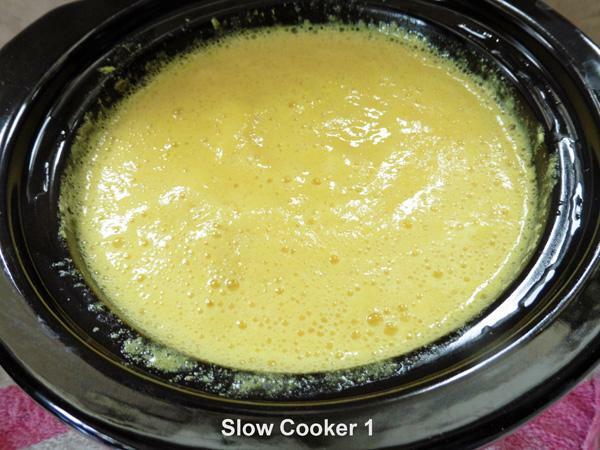 This effect can be obtained by making it in a slow cooker, see notes. 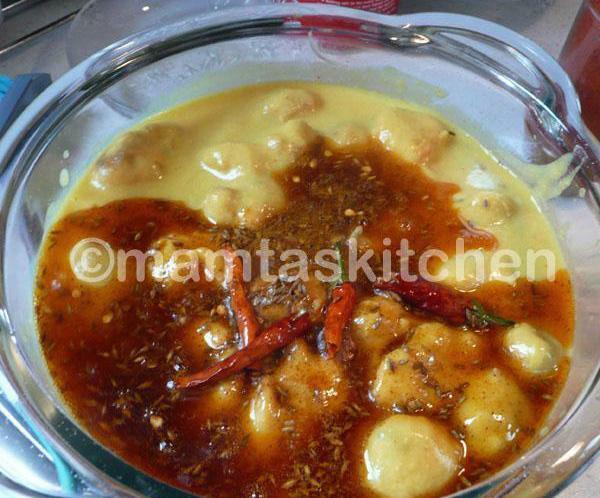 While the Kadhi is cooking by your chosen method, make the dumplings as follows. Place all ingredients for dumplings in a bowl and make a batter of dropping consistency, with enough water. Beat it well. The trapped air is what will make them light and fluffy. Solid dumplings do not taste nice. 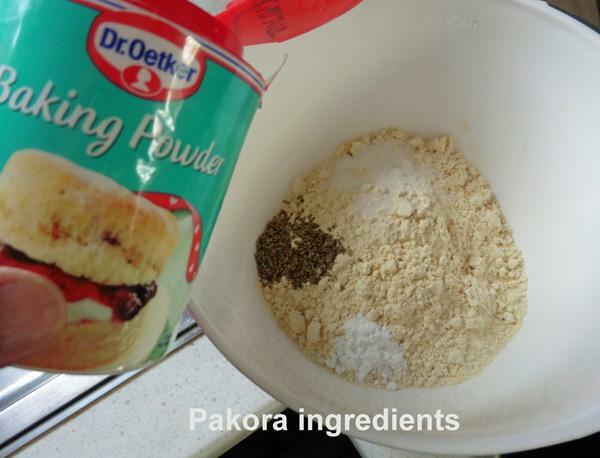 My mum used to make pakoras without the addition of baking powder. She beat the batter by hand, until a drop of it dropped in a glass of water floated to the top, instead of sinking down. I use electric beater, much faster! 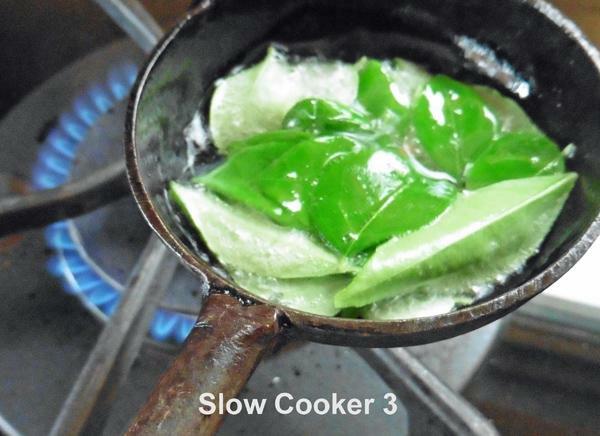 Heat oil to a medium heat (just before beginning to smoke), in a wok or kadhai. When right temperature is reached, a drop of batter dropped in the oil should float sizzling to the top. 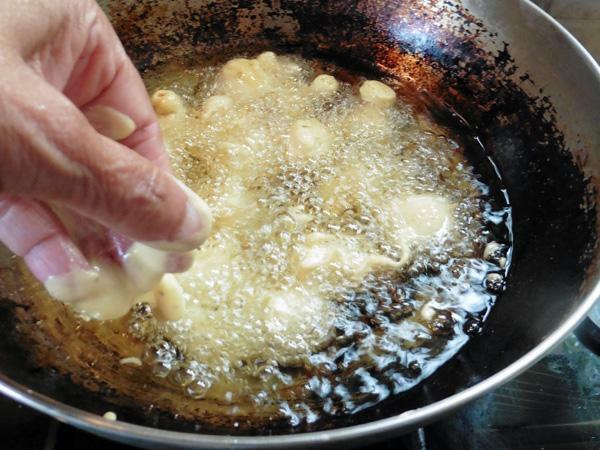 Drop dollops of the batter into the hot oil, either with a dessert spoon or with your fingers. Do this gently, from the side of the wok, to stop the oil from splashing on to your hands/face. Make as many at a time as can float without overlapping each other. Fry until golden brown. Keep aside. (I make extra as my family always eats quite a few while I am frying them. 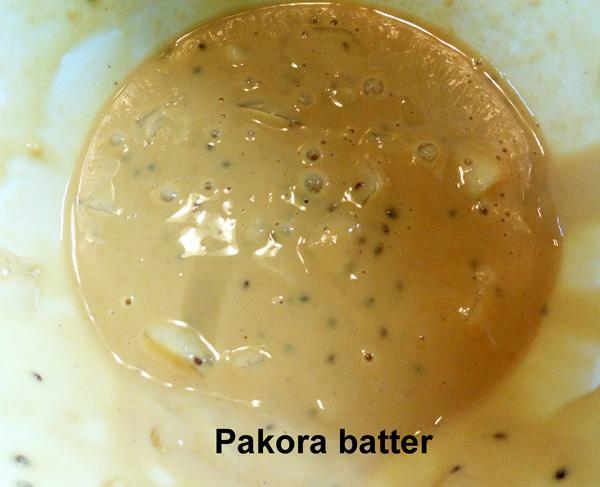 When the sauce is ready, add pakoras/dumplings to the kadhi, stir and turn heat off. Let them soak and absorb the sauce for an hour or two. If the kadhi becomes too thick at the end of this, dilute it with boiling hot water, stirred in gently. It should be of a custard like consistency. 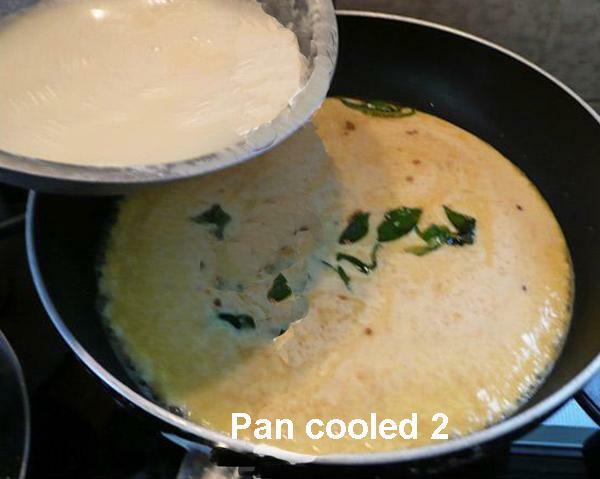 Tempering: Before serving, heat the kadhi and place in a serving bowl. 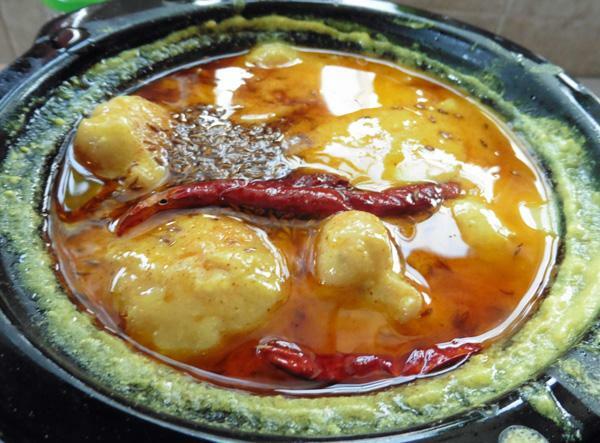 Heat ghee in a large ladle or small pan. Add cumin seeds and asafoetida. Once the seed splutter, add whole chillies, chilli powder and stir quickly with a spoon. Pour it over the kadhi. Cover with a lid immediately. This will allow the flavours to infuse. Also see Kadhi Soup and Gujrati Kadhi. You can omit dumplings altogether if you wish, and add vegetables like boiled and dices potatoes, sliced onions, 7-8 spinach leaves or a handful of fenugreek/methi leaves and a few drumsticks cut into 4-5 inch pieces. These drumsticks are not chicken legs, they are an Indian vegetable called Senjan ki phali in Hindi. You can use Boondis, instead of pakoras. 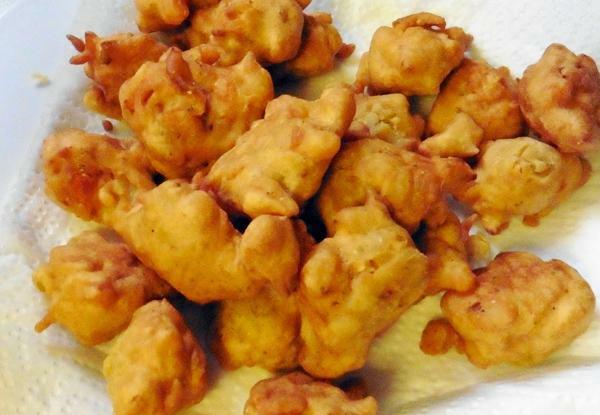 Microwave pakoras/dumplings are low fat and can be cooked almost fat free, without frying. 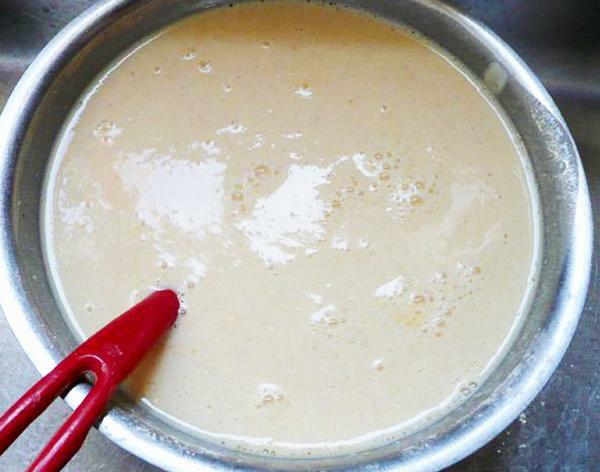 Place all dumpling ingredients in a bowl + 1 teaspoon oil and make quite stiff batter. Place about 8 dollops of this batter on a microwave steamer plate. Steam at around 800 power, for 2 minutes. Adjust time for different powers. My elder brother Ashok taught me this method. He says, “the reason why you have to add a little oil to the batter is that fat in the batter heats up 'preferentially’, faster than the rest of the material. This helps to cook the entire core uniformly. It is a known scientific fact that the electro-magnetic waves produced in a microwave oven are preferentially absorbed by good conductors of electricity and by certain long chain molecules of food, like in fat, egg yolk, sugar and even water which is a better conductor of electricity than flour. This is the reason why when you try to roast peanuts or almonds in a microwave, you may be able to handle them with naked fingers, but try putting them in your mouth, you will almost surely scald your tongue! Similar thing happens when you warm samosas or patties in a microwave when the filling gets heated much more than the skin.